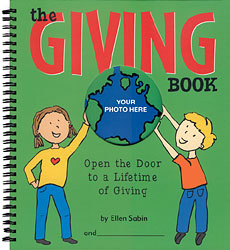 THE GIVING BOOK – OPEN THE DOOR TO A LIFETIME OF GIVING is truly a gift for young readers ages 6 to 11 – inspiring, teaching and engaging them to give back to the world. It is a unique, interactive process that allows parents, teachers or friends to help children understand giving and participate in a stimulating experience. The 64 page, spiral-bound, hardcover book combines colorful illustrations and entertaining narrative with fun learning activities. The book helps them record their ideas, dreams and wishes for the world – making them the authors of their stories and creating a “scrapbook” of their journey into compassion, philanthropy and the power of their actions. The Giving Book grows kids with character by: Nurturing caring and kindness. Teaching that every good deed is a gift with a powerful impact. Showing the power of actions and thereby increasing self-esteem and sense of self-worth. Inviting experiences that show the importance of charity and community. Providing an educational and engaging experience that children can do on their own, in the classroom or with their friends and family. Building their self-esteem by helping them understand the power of their actions and their ability to be kind, compassionate and helpful. Why The Giving Book is SO important… Giving and volunteering is important for the people, animals, or situations that receive the services of the donors or volunteers. It brings people together towards creating healthy communities. However, that’s not the best part! Teaching children to care about others serves them!! Showing children that their actions matter and can make the world a better place, strengthens their sense of self worth. Inspiring kids to participate in volunteer experiences, exposes them to new people, new friends, and new situations. Giving children an outlet of ‘doing something of value’ when they are upset about something that’s happened (like a hurricane or other event), helps them cope in a positive way with their feelings. The selfless act of helping a person, cause, or nature provides a spiritual boost, as well. In addition, studies show that children who give and volunteer, do better in school and have higher self esteem. The Giving Book offers children, families, and communities a proven and award-winning approach to inspiring giving and charity! Books are available that touch on the concept of nurturing character by telling a story, but children also desire the opportunity to participate- to express themselves and BE the main character in their experience. The Giving Book let’s them jump in. 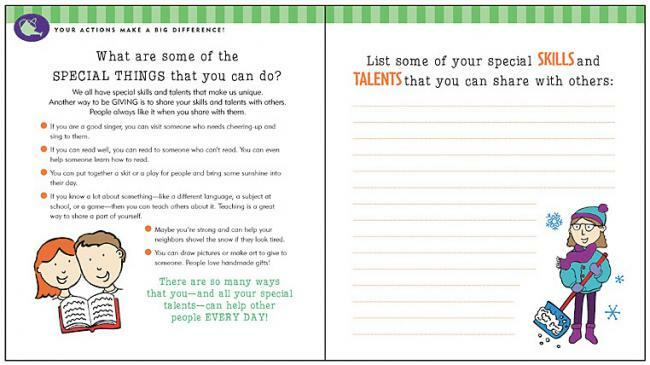 This book is ideal for use in classrooms, camps, and other group settings. (A free Teacher's Guide is available to help teachers maximize the impact of the book.) Other free Tools and Guides are available for parents and community leaders- including a "Giving Book Party Guide".